Much like the Dutch Tulip Craze or Beatlemania[sic], fashions have rocked the insect world since humans flipped over their first rock. One European beetle of note, Panagaeus, was the object of much veneration, which persists even into modern times. Indeed, Panagaeus is a member of one of the most relevant and interesting collection of organism on earth: the one I study. To this day, Panagaeus is to me a sacred genus. I look at the Orange Cross as the emblem of Entomological Knighthood. Darwin was also fond of recounting a tale from his youth about this same genus. I must tell you what happened to me on the banks of the Cam in my early entomological days; under a piece of bark I found two carabi (I forget which) & caught one in each hand, when lo & behold I saw a sacred Panagæuscrux major; I could not bear to give up either of my Carabi, & to lose Panagæus was out of the question, so that in despair I gently seized one of the carabi between my teeth, when to my unspeakable disgust & pain the little inconsiderate beast squirted his acid down my throat & I lost both Carabi & Panagæus! What makes Panagaeus so special? I’m not exactly sure. They’re one of the only carabids that produce phenols in their defensive sprays. Some are adapted to feed on snails. They among the most xeric habitat tolerant carabids known. 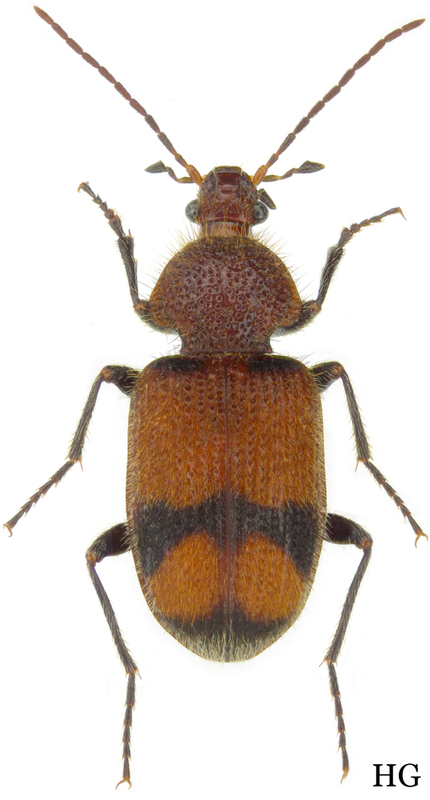 I’ve sequenced a Panagaeus transcriptome, as part of a larger phylogenetic project, in hopes of understanding what that quality is. While analyses are still ongoing, I’m optimistic they will yield pieces that will be useful in resolving the Carabidae family. Or if that fails, at least they look cool on T-shirts. Darwin, C. (1887). The Autobiography of Charles Darwin. Barnes & Noble Publishing. – (1836). Letter 299: Darwin, C. R. to Fox, W. D., 15 Feb 1836; reproduced in Burkhardt, F. and Smith S. 1985. The Correspondence of Charles Darwin, Volume 1: 1821-1836, pp. 491-493. Cambridge University Press, Cambridge.